WEST Bengal witnessed militant strike struggle on January 8-9, as part of the national strike call. There was intensive campaign for nearly one month. Trade unions, Kisan and agricultural worker’s organisations and other mass organisations campaigned from their own platforms. 17 Left and allied parties supported strike call. Hundreds of small meetings, street corner, gate and market meetings were held, explaining demands of the strike. Innovative style of campaign was also adopted; like, a ‘ticket” of train of “no journey”, distributed by SFI-DYFI. All these resulted in building the determination of two-day strike. Adversary was stringent and aggressive as well. TMC government was playing in tune with Modi government and geared up for repressive measures. The government employees were threatened with “dies non” or break of service in case they join strike. TMC intimidated transport workers, factory workers, and small traders not to join in the strike. But on those two days, a new chapter of courageous struggle was written. Thousands of Left activists started road and rail blockade, processions from early morning on Jan 8. The strike evoked huge response from the masses. Though there was some movement of transport in Kolkata, the district towns were deserted. Tea and jute, factories were closed. After almost a decade, strike was observed in Darjeeling hill areas too. There was superb shut down in Durgapur-Raniganj belt, Barrackpore industrial zone. Banks were fully closed. What was striking; thousands of peasants and villagers came on the highways, demonstrated and blocked traffic. TMC government and its police aggressively attacked the strikers throughout the state. From the very beginning police arrested trade union leaders, including CITU state secretary Anadi Sahu. Left Front legislative party leader Sujan Chakraborty was arrested on both the days. 1,500 activists were arrested, many of them for simply walking in a rally. But there was strong resistance too. Everywhere immediate protests were organised. Running battle with police was on. Kolkata itself became a city of rallies once again. CPI(M) state secretary Surjya Kant Mishra condemned the attack as ‘fascistic’ and termed Mamata Banerjee as the trojan horse of BJP. He thanked the people of Bengal for creating a new history. THE people of Kerala, including workers from all sections, government and private employees, teachers, scheme workers enthusiastically joined the historic two-day strike. Public vehicles including buses, taxis and three wheelers were off the roads. Train services were also disrupted throughout the state as the workers observed rail roko protest. The service of trains including Venad Express, Raptisagar Express, Jansatabdi Express was interrupted. KSRTC buses and private buses were also kept off the roads. The strike had started at midnight of Monday January 7, with a massive protest march of the workers. Almost every town witnessed these huge marches, attended by thousands of women. It is estimated that 1.30 crore people have participated in the strike. There were 482 strike in the state. The main commercial centers like Chala market in Thiruvananthapuram, Valiyangadi in Kozhikode and main markets in Kochi and Thrissur were also paralyzed even though the workers coordination did not compel the shopkeepers to close their establishments. In a pandal near secretariat in Thiruvananthapuram, workers organized programmes round the clock. Slogans, songs, dramas were enacted in this pandal. No container reached in Kochi port and Vallarpadam Container terminal. Beypore port had become standstill. In Hindalco plant, total workforce including BMS members participated in the strike. The support from the professionals from IT and IT enabled service sector was unprecedented. Around half of the workers from these sectors participated in the strike. Plantation sector was completely paralyzed in the state. Prepaid taxi drivers in the airports and water transport workers also participated. The cargo section did not function in airports. Government offices, universities, colleges and schools did not function in these two days. The Sabarimala pilgrimage was not at all interrupted in the strike. The government had provided all facilities to the pilgrims, especially from neighboring states. STRIKE was successful on the first day, January 8, throughout the state of Andhra Pradesh. The call of trade unions for the strike was well received by the working class. CITU, AITUC, INTUC, IFTU, HMS, UTUC, YSRTU and other trade unions, associations and unions of banks, insurance etc., gave the strike call for January 8-9. The workers and employees of public sector units; BHEL, Hindustan Ship Yard, Visakha Steel plant, HPCL etc., were on strike. The services of banks and post offices came to a standstill in the state. Auto and lorry workers also participated in the strike. Student and youth organizations’ call for education institutions ‘bandh’ in synchronization with the strike also was well received. Anganwadi, ASHA, Mid day meal etc., scheme workers participated fully in the strike. Teachers, state government employees participated in the rallies all over the state. Leaders and cadres of all trade unions except BMS led many rallies. Leaders of CPI(M), CPI and other left parties addressed rallies and meetings and expressed solidarity with the working class. BRAVING all threats and intimidations the entire Tripura was almost standstill and wore the look of a total shutdown against the policies of Modi government and the murder of democracy by RSS- BJP in Tripura. Fatwas were issued to transport workers, small shopkeepers, employees of dire consequences if they participated in the strike. But ignoring all sorts of threats, from the morning itself the streets in Agartala and all the subdivision headquarters wore a deserted look. The ever busy ISBT and other motor terminus of the city were vacant. Shops and markets including the wholesale market of Maharajganz were closed. Offices and schools remained open but with a very thin presence. Tea gardens were closed. This was the picture in all the urban and rural areas. Sensing that the strike was getting huge response, BJP in different places in Agartala and elsewhere jumped in action. Bike brigades of hoodlums were pressed in to open shops, post offices and banks. However they did not succeed and there was very thin presence. CPI(M) state secretariat congratulated the people for their massive response. CITU president Manik Dey, vice president Tapan Chakraborty in a press conference congratulated the people for this huge and spontaneous response. Several tribal students and youth organisations too had called a strike opposing the Citizenship Amendment Bill. In Madhabbarri of Jirania they resorted to picketing. Here police resorted to firing. Six youth were injured. They are being treated in GB Panth Hospital. CPI(M) leaders including Manik Sarkar former CM, party state secretary Gautam Das, CCM Tapan Chakraborty, state secretariat member Ratan Bhowmik and TTAADC CEO Radhacharan Debbarma visited the hospital and met the injured. Badal Choudhury and Manik Dey also visited the hospital. CPI(M) and GMP in separate statements condemned the police firing. THE first day of the two days general strike in Manipur was a grand success as the roads wore an abandoned look with no vehicular traffic. Inter state bus services were stopped, banks, insurance, post office, BSNL and other central government offices were closed , school and colleges postponed their examinations and new schedule was announced. Other educational institutions were also shut down by the teachers and staff , markets were also closed including the Paona Bazar, Thangal Bazar, Moreh International market and Ima Keithel (market), The state government employees also organised sit in demonstrations in their respective offices , work at the construction sites was stopped. The motor workers organised ‘chaka bandh’ including the petroleum tanker drivers union . The un-organised workers also organised gate meetings in some places , the scheme workers- midday meal , anganwadi, ASHA , ATMA and NHM organised road blockades on national highways. Some of the meetings and sit in demonstrations were addressed by Kshetrimayum Santa and Sarat Salam of CITU, L Sotin and Thokchom Suresh of AITUC, Y Ranapratap of INTUC , K Manoranjan of UTUC, L Sarat of AIGSF , N Motikumar of BSNLEU, H Yaima of pensioner’s association. The general strike by central trade unions, central, state government departments and PSUs was successfully organised in Punjab. On the second day the impact of the strike further increased in Punjab . Many unions which are not affiliated to the central trade unions also joined the strike. The truck unions all over the state came in support of the strike. More than 7,000 workers of industrial area in Ludhiana were on strike. Similarly industrial area of Asron in Nawanshahar district was affected by the strike as all the major factories were closed. The National Fertilizers Limited(NFL), thermal plants, both the cement factories of Ambuja and Ultratech and pesticides factory were closed in Bathinda. Thermal power plants at Ropar were also closed. Gaganghe factory at Rajpura was closed. The industrial establishment in Sangrur was also closed. Workers blocked the rail and road traffic at many places. Central, state government employees along with bank and insurance employees took out rallies through main bazaars of the cities all over the state. Postal and BSNL services are affected for the second day. Medical representative unions, anganwadi workers, ASHA and mid day meal workers took out processions and rallies. 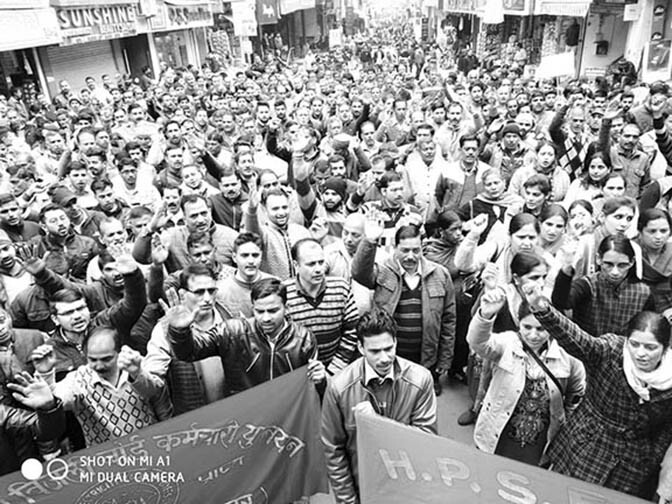 The main print and electronic media also gave good coverage to the strike. THE all India general strike call evoked good response of the people in all the 30 districts of Odisha. In all the districts from southern most adivasi dominated Malkangiri to northern Mayurbhanj district it took the shape of bandh. Total work force of casual and temporary workers of steel, coal, dock, NALCO, NTPC along with a sizable section of the regular workers joined the strike. Banking , insurance and postal sector came to a stand still as the employees abstained from the work. The strike was total in these sectors. So also the road transport of both government and private sector came to stand still on both the days. Trucks, buses, four wheelers and auto rickshaws were off the road . National highways took a deserted look. Several trains originating or passing through Odisha were detained due to picketing at various places of the state. In the rural Odisha, scheme workers like asha, anganwadi, mid day meal, krushak sathi etc., along with construction workers joined the strike in thousands. In the power sector all the out sourced and temporary workers along with office employees seized work and organised demonstrations. In many places the offices were locked by the agitating employees and workers. Shops, business establishments and financial institutions across the state from cities like Bhubaneswar, Cuttack, Rourkela, Berhampur to district level towns downed shutters. Schools , colleges and educational institutions were closed. Hundreds of government offices were closed too due to picketing in almost all the districts. CPI(M) and other left parties extended full support to the strike call and participated in 23 out of 30 districts of the state. BJD and Congress too supported the call. But BJD neither issued any open statement nor participated in the strike. Under the leadership of CPI(M) and its mass organisations more than 20,000 people at more than 130 places of 23 districts participated to make the strike a success.